Censorship is a huge problem in public schools and universities and most parents have no idea. If you doubt it simply go to thefire.org where you can see literally thousands of examples of illegal censorship and retaliation by academics and university administrators. The site is updated almost daily with new examples. To see real life examples of incredible censorship and retaliation on video go HERE. Fordham’s 2006 commencement speaker was MSNBC host Chris Matthews. 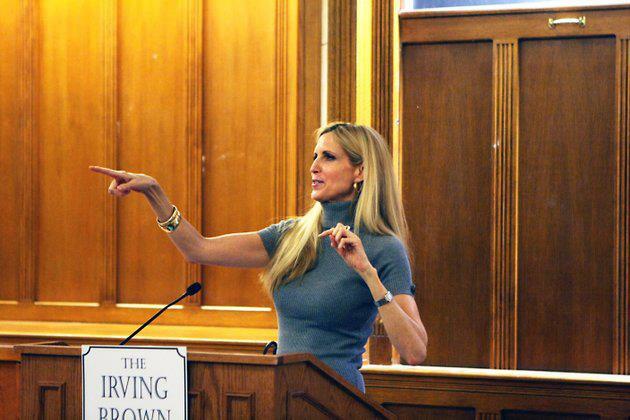 The university did not even wait for Coulter to give her speech before condemning her. Robert Shibley of The Foundation for Individual Rights in Education said “Can Fordham’s adult students not be trusted to make up their own minds about the views expressed by a speaker? Does Father McShane believe Coulter is so diabolically clever that her use of ‘disgusting’ rhetoric will somehow fool Fordham students into believing what she wants them to believe? If so, he has a significantly lower opinion of the quality of American college students than I do. This entry was posted in Academic Misconduct, Civility, Culture War, School Indoctrination, True Talking Points and tagged american college students, ann coulter, foundation for individual rights in education, politics, yale daily news, yale political union. Bookmark the permalink.